I count my time in Paris not by days but by meals. You would think that it would be pretty close to impossible to have a bad meal in Paris, but you would be wrong. Like anywhere, there are tourist trap restaurants that serve tough meat, old bread, and terrible food in general. Being with three young children just compounds the challenge as many restaurants will downright refuse to serve children. I don’t blame them, most Paris restaurants have only one seating to offer patrons long, relaxing meals and understandably don’t want their guests disturbed by kids. One of these days, I’ll rob a bank and get a babysitter to finally eat at three-star Michelin rated Paris restaurants like Guy Savoy, Pierre Gagnaire, and Alain Ducasse au Plaza Athenee. I might even throw in a visit to La Tour D’Argent whose elevator up to its restaurant I’ve dreamed of riding in ever since I was a little girl. But for now, our entire family is thrilled to be eating together at carefully chosen Paris bistros. 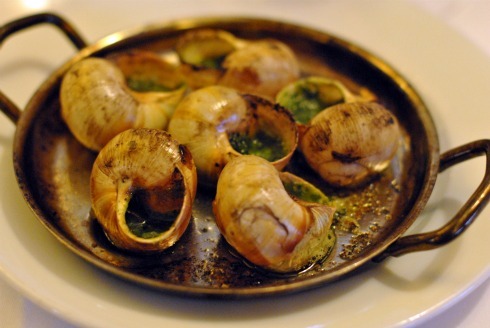 Hot, buttery, garlicky escargots are always my first order when I go home to France. 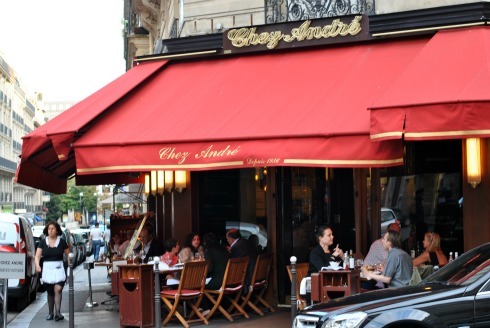 Chez Andre is the epitome of the typical white tablecloth Paris bistro. The food is excellent, traditional French fare like a rognons de veau, escargots de Bourgogne and terrine de foie gras. The kids split a perfectly roasted half a chicken drizzled in a light pan sauce served with crispy and thin fries. I tucked into a Chateaubriand steak with Bearnaise sauce that just melted in my mouth. Steve devoured a magret de canard, thinly sliced duck breast slices in a rich red wine reduction sauce with potatoes that had been sauteed in duck fat. 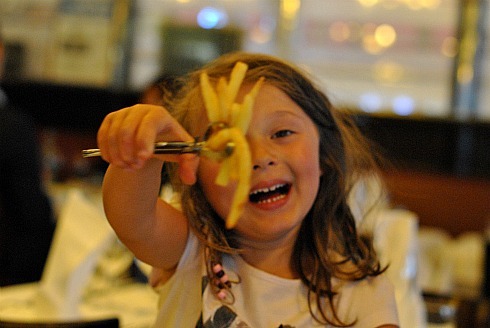 That first bite of Les Frites makes everyone giddy. We had planned to spend our second and last dinner in Paris at L’Entrecote, a restaurant at the Porte Maillot that only serves their signature sliced steak drizzled in their secret parsley sauce, but they were closed. We raced back to the Quartier Latin near our hotel and had a disappointing meal. In retrospect, I now realize that we should have gone back to Chez Andre for a second night of feasting to pace ourselves and make it to dessert, but there’s always next year. Not sure what's more fun. Eating escargots or grossing out the kids. “not by days but by meals”—GENIUS! 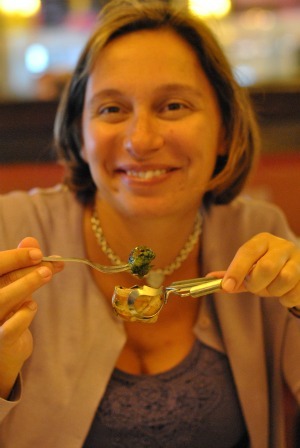 You are so gleeful extracting the escargot…what a great post! Ah, France! I am so jealous of your summer travels. Have so much fun. . .fun enough for me. We totally need to connect when you return. It has been TOO LONG. We’re going to Paris! I can’t wait to check out your amazing recommendations.